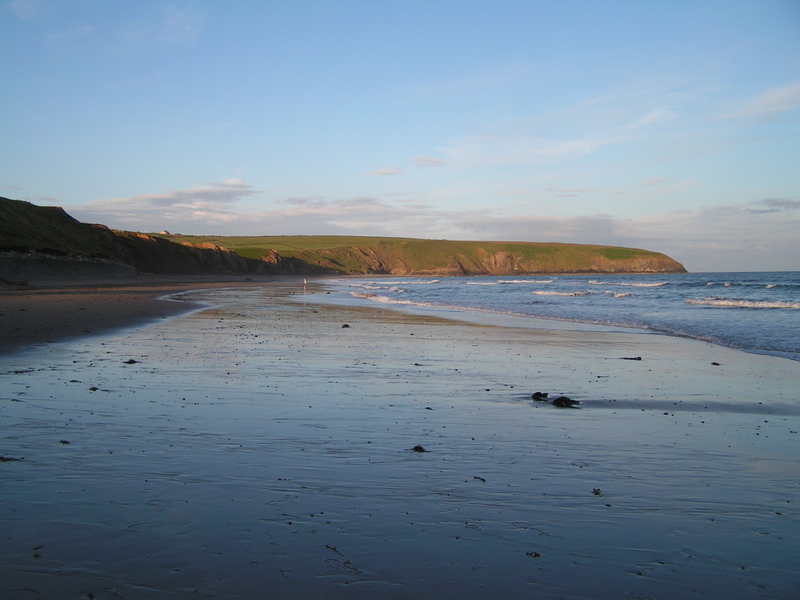 Especially Aberdaron. And, yes, I’ve written about it before. Once or twice. That endless sea, bound by a long bay that keeps it from being melancholy. Swallows’ nests in the cliffs. Seals that I’m certain pop out only when I’m not looking. Memories of the poet-priest, RS Thomas, lingering in the wind-lashed chapel – and living in books on sale in the Post Office. I love it for the peace that a visitor like me finds there, knowing I can’t go any further unless it’s by boat. 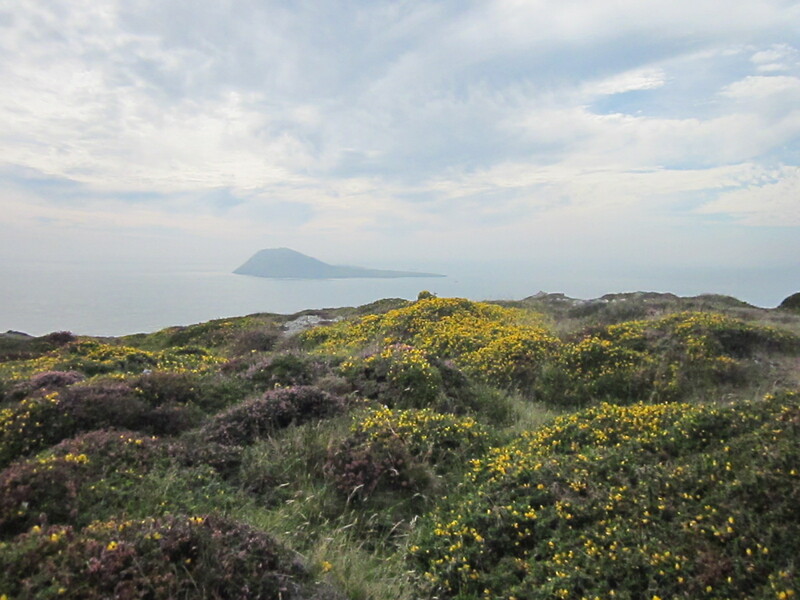 And taking that boat to Bardsey, to commune with its countless saints. 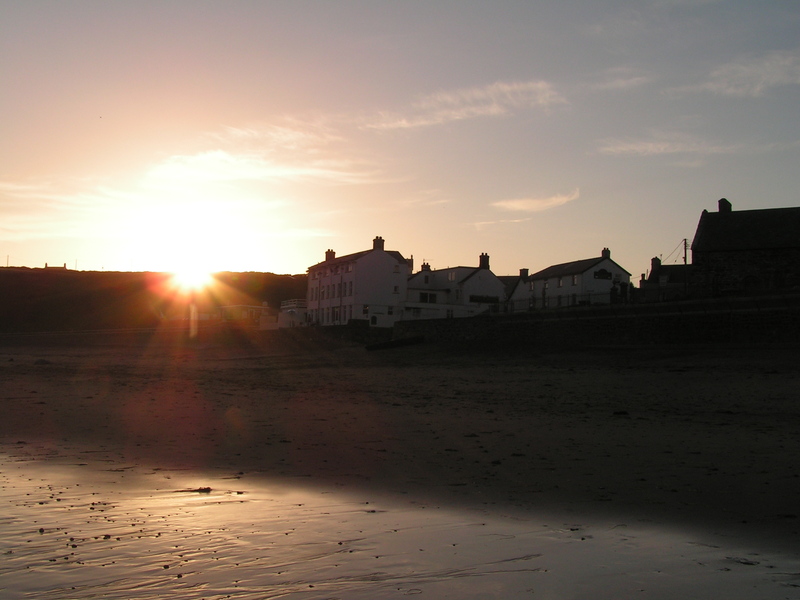 Oh, yes, I love Aberdaron. So why did a post from Elladee on her needs-must, creative response to a kitchen equipment failure inspire me to write this post? Well, we’ve had plenty of good things to eat in the village. 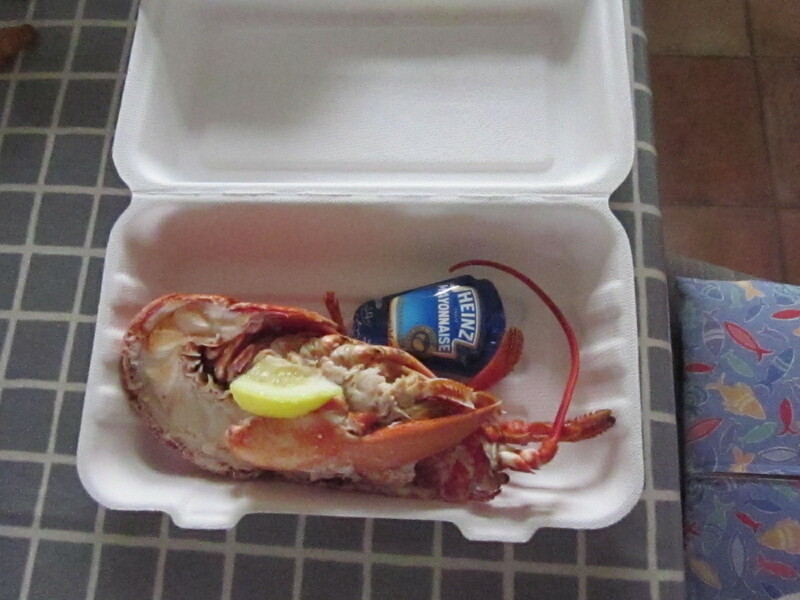 Lobster halves and gurnard goujons from the chippy. Delicious, ever-reliable (in our experience) meals at the Ship Hotel. If you’re self-catering, though, and imagine you’ll find a greengrocer and butcher, you’re going to be disappointed. The village food shops are not – last time we were there, anyway – a gourmet’s dream. But the bakery’s always been worth a visit (their cakes are far too appetising). And the bigger convenience shop in the village sells good quality meat and a decent range of fresh vegetables. Which is (ahem) convenient. Because when we stay there, to keep costs down, we mostly cook for ourselves and try to buy our ingredients from the local shops. And that can require ingenuity. A needs-must approach. On the penultimate night on one of our stays we felt the urge to eat Welsh lamb. The shop had chops. We bought four tiny ones. Each not more, really, than a chunky mouthful of meat and a slick of tasty lamb fat. Yes, fat. I know, it’s bad for you. But lamb fat tastes so good when it’s browned and sticky. Just nibble a teeny-weeny bit and you won’t go to hell for it, honest. When I was little, as well as sneaking titbits of lamb fat, I used to stick my little finger into the lamb leg bone when no-one was looking and scoop out a morsel of marrow – mmm! Anyway. So far so good. We had lamb. Now, what to eat with it? We had a bag of couscous. That sounded like a good combination. The shop had red onions and I bought two, plus a huge bunch of parsley and one of mint. It had tinned ratatouille, tinned chick peas, tinned peaches in juice – I bought one of each. We’d brought ground coriander, hot smoked paprika and cinnamon with us. It was quick to make and really delicious – I say this with an element of surprise as some of the things I make up on the hoof are interesting but not experiences I’d wish to repeat. Fry the sliced/chopped red onions. Shove them off to the side of the pan or put them on a plate temporarily. Fry the lamb chops for a minute or two either side to brown them then put the onions back in the pan, or stir them back into the mainstream, depending on what you did with them. Add the drained and rinsed chick peas. Add the seasonings, to taste (I use a teaspoon of coriander, half a teaspoon of hot smoked paprika, half a teaspoon of cinnamon and sometimes a bit of Tabasco too). If you feel it’s necessary (I do) add boiling hot water to thin it out. Cover the pan and simmer. While the lamb cooks make up the couscous according to the instructions on the packet of the variety you buy. Chop some peach or apricot and a little fresh mint and stir into the couscous before you serve it. Stir as much chopped parsley as you fancy (or none – it’s optional) into the lamb mix after about fifteen minutes, cook two or three minutes longer and then serve. Thanks to Elladee for reminding me that the joy (mostly) of cooking is a great thing to share. 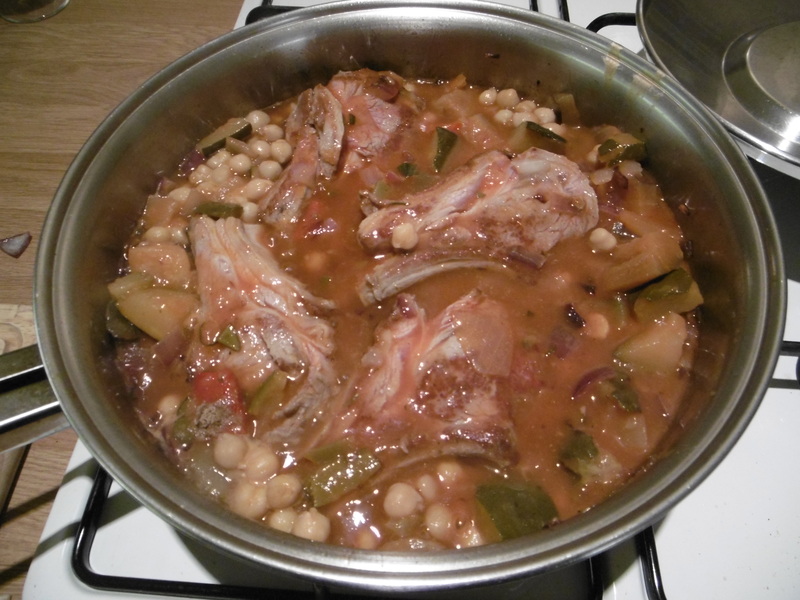 This entry was posted in Llyn Peninsula, Simple Food for Simple Folk (like me) and tagged Aberdaron, Bardsey Island, chick peas, couscous, gurnard, https://elladeewords.wordpress.com/2015/08/01/in-my-kitchen-not-even-half-baked/, lamb chops, lobster, poet-priest RS Thomas, ratatouille, Ship Hotel Aberdaron. Bookmark the permalink. Lamb marrow? What a precocious child you were. Love this kind of cooking: a combination of inspiring ingredients (the lamb, bien sûr!) and an exotic addition of what is on hand to make the most of it. A lovely mash-up is this post. Bon appétit! Thank you! Glad you enjoyed it – and yes, it wouldn’t be the same without really good lamb chops. It is my favourite meat. I don’t get the marrow any more as we don’t get such big lamb joints! Ooh lovely. I was only saying last weekend as I created dinner from lamb necks, tinned tomatoes, onions and seasonings similarly, that lamb and tomatoes are one of my favourite food combinations. The addition of chickpeas and couscous would make the most the flavours. I think one of the benefits of self catering travel is finding and cooking local products… and it doesn’t take me long to get tired of restaurant café offerings plus they never serve enough salad veges for my liking. Although I could possibly make do with the Welsh fresh seafood offerings 😉 But with that view, I’d want to eat it them in the rented cottage. I have a penchant for meat fat, marrow etc apparently a legacy of my grandfather, so when I eat those tasty bits I always think of him. 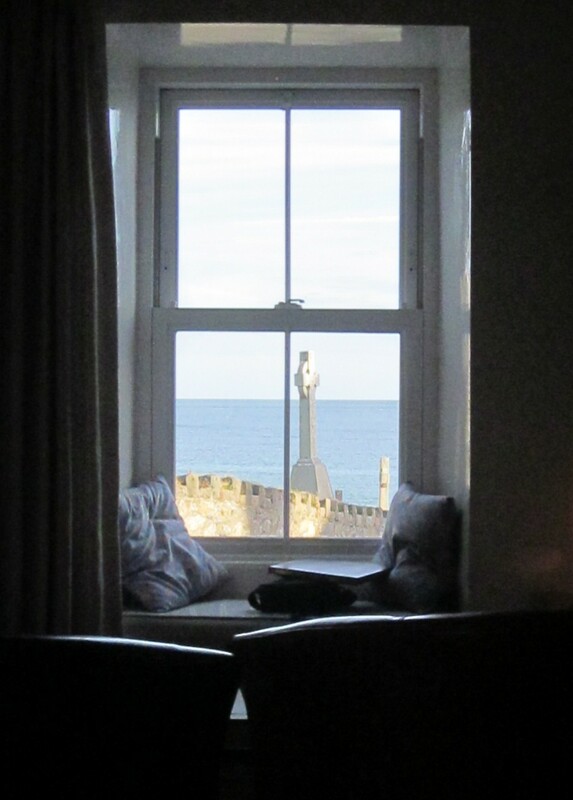 Yes, that seafood was crisp and very tasty – and takeaway so we had the view too. 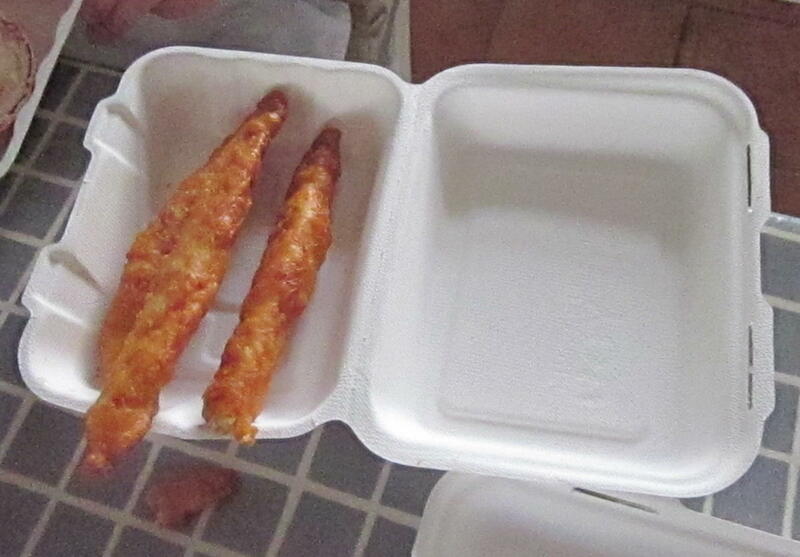 I know what you mean about veg – I really missed them in Spain despite the awesome fish. Glad to hear you are another secret fat nibbler!